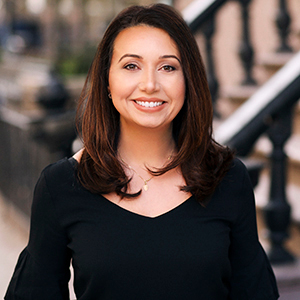 Since entering real estate nearly two decades ago, Ivana has continued to soar as a top-producing broker, recognized as one of Manhattan’s Top 100 Agents by the TopAgentGuide. Her reputation has made her a commentator on NY1 News and HGTV’s Selling New York, as well as a speaker at national and international real estate conferences. Ivana’s accomplishments in her industry are matched by the ongoing honors and praise she receives from her satisfied buyers and sellers. Loyal clients appreciate her expertise, benefit from her extensive knowledge, and vow to “never work with anyone but her again.” Ivana takes full advantage of the many marketing resources available to her and has had much success in utilizing professional videos to market apartments. What also sets Ivana apart is her unmatched energy, enthusiasm, commitment to clients’ needs and ability to facilitate that perfect match between wonderful people and properties. Plus, her warm, easygoing style melds with her integrity and market knowledge, making Ivana a respected and sought-after specialist in her field by clients, peers, and press seeking her valuable insight. A specialist in Gramercy and Downtown, Ivana is also a building specialist at the Foundry Co-op, where she has set many prices per square foot sales records. She also serves both domestic and international clients as a Certified Senior Relocation Agent. As a real estate investor herself, she is well versed in 1031 exchanges and provides her clients with counsel on a multitude of investment opportunities. Ivana was the director of marketing and a sales associate for an award-winning real estate team in Washington, D.C. A George Washington University graduate with a degree in Environmental Studies, she previously worked in environmental management consulting for the Environmental Protection Agency’s Superfund Redevelopment Initiatives. Ivana, bilingual in English and Italian, is a proud Gramercy resident and owner in a historic condo building. Originally from the scenic islands of Ponza and Ischia in Italy, she loves living in Manhattan and thrives on the city’s diverse offerings. Ivana enjoys spending time with her husband and children, cooking, gardening and traveling.